Summer is almost over — and at long last, the College Football Betting Season is about to get started. College Football has been one of Sports Insights “most consistent sports” in terms of “betting against the public” — with NO losing seasons since Sports Insights started publishing Square Plays back in 2003. Last year was a banner year for Sports Insights’ contrarian betting strategy using college football betting trends in the college football marketplace — with our 2010 College Football Square Plays winning 63.6% of its plays. Please check out Sports Insights’ popular and best-selling College Football Sports Investing Book, that highlights our approaches and methods. In this article, we update our “betting against the public” results for college football — and break the results down for home and visiting teams. The information on this site is for entertainment and educational purposes only. Use of this information in violation of any federal, state, or local laws is prohibited. 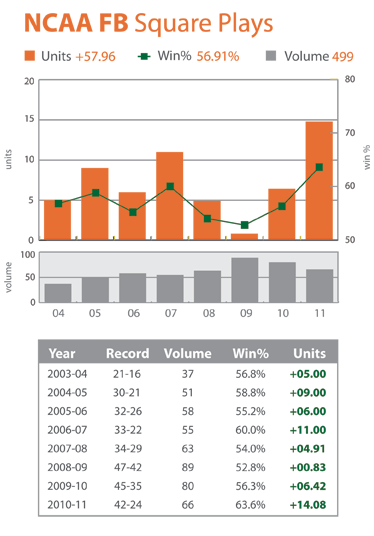 Sports Insights (SIs) has collected betting data for every major U.S. sport since the 2003. We collect the opening and closing lines (and “line movement,” for various sportsbooks) as well as final scores — and perhaps most importantly, Sports Insights proprietary betting trends. Sports Insights betting trends data is taken from real bets placed by the public at actual sportsbooks, unlike other sites who can only provide betting consensus data. Our research team also cleans our betting data with various systematic techniques — as well as “by hand” — to ensure our historical data is useful for our research articles and our Members. Sports Insights historical odds database for each sport is an important part of our sports betting research and value-added for our Members. It is the backbone for our contrarian sports investing methods and you can’t find this kind of data and information anywhere else! Sports Insights’ college football betting database for College Football now includes more than 5,500 games over the past eight seasons. For the purposes of this article, we include the Bowl Games. Our betting database and contrarian sports betting methods are backed by tens of thousands of games across every major U.S. sport. Below are college football results for “betting against the public” using college football betting trends over the past several years. We broke the results down for home teams and visiting teams. In addition to overall “Bet Against” results, we have broken down how Betting Against the Public performs for Home teams or a Visitors. For example, if a Home team has less than 23% of the public betting on them (Visitor has more than 77% of the public), this scenario resulted in a 53.6% winning percentage. On the other hand, Visitors with less than 23% of the bets (more than 77% of bets on Home team), resulted in a 50.2% winning percentage. There appears to be some value on Home teams in college football. Over the years, College Football Square Picks have done reasonably well compared to the “Bet Against” results shown above. Our industry contacts and analytical tools allowed us to focus on “bigger games” with national focus — leading to more contrarian betting value. One indicator that our Sports Insights researchers use as a proxy for “bigger games” is the Number of Bets that we compile for every game. If the game is one of the more heavily-bet games of the day, you know that the Public is betting that game big. The games with the larger Number of Bets tend to have more contrarian value as we mentioned in this previous article. If you like our articles and methods, please check out our series of Sports Investing books! College Football Square Picks – 8 Consecutive Profitable Seasons! In 2010, Sports Insights’ College Football Square Plays enjoyed its eighth consecutive profitable year in College Football, winning 63.6% of its plays! The team at Sports Insights is able to access several key industry contacts — as well as leverage our database, research, and up-to-the minute betting odds and betting percentages — to help our members improve their college football handicapping results. We do not guarantee that the trends and biases we’ve found will continue to exist. It is impossible to predict the future. Any serious academic research in the field of “market efficiencies” recognizes that inefficiencies may disappear over time. Once inefficiencies are discovered, it is only a matter of time before the market corrects itself. We do not guarantee our data is error-free. However, we’ve tried our best to make sure every score and percentage is correct.